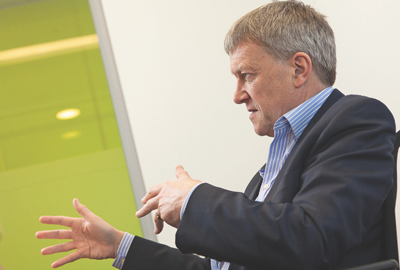 It's been a high-profile entry into the children's charity sector for Sir Tony Hawkhead. On his first day as chief executive of Action for Children he appeared on BBC One's News at Ten to launch the charity's report on child neglect. Then the government announced it would introduce legislation to outlaw the emotional abuse of children - an issue the charity has been campaigning on for three years. The day before this interview, he spent the night sleeping rough with other chief executives to highlight youth homelessness. Any lack of sleep is not evident, however, as Hawkhead talks of the personal passion that he brings to his new role at the charity, which does adoption and fostering, family support, and services for children in care and disabled children. He was the father of a disabled child who died. "I know how it feels to have a sense of helplessness about wanting to do the best possible thing for your child," he says. Hawkhead previously served 17 years at the helm of the environmental regeneration charity Groundwork. The change of sector is not the great leap that it might appear: Groundwork also works on projects for young people, focusing on those living in poverty; and the largest income source for both charities is the delivery of public services. It is this over-reliance on government contracts - accounting for about £160m of Action for Children's £180m income last year - that Hawkhead identifies as the charity's biggest challenge. A particular problem is local authorities taking services back in-house or offering only short-term contracts, which, he says, "benefit no one, especially not children". Calling for longer-term contracts to enable the charity to approach them in more cost-effective ways, make economies of scale and get long-term benefits from investments was something he was also doing at Groundwork. "It's daft that a local authority is talking to us about taking over a substantial part of their services, but when we ask what period of time it has in mind, the answer is 'one year',"he says. "That is not how things can possibly be." He argues that evidence shows longer-term contracts work, as long as there are regular reviews. "Both sides should share the risk and the rewards," he says. Hawkhead believes that charities should be on the "front line of delivering the most difficult and acute care" because, unlike businesses, they are not under pressure to deliver profit for shareholders. But he cautions against using donors' money to subsidise public service contracts: a substantial part of Action for Children's donor income comes from the Methodist community. It was a Methodist minister, Thomas Bowman Stephenson, who founded the charity more than 140 years ago. "The bonds are very deep," says Hawkhead. "We should celebrate that historic connection but at the same time build new connections that bring in new income. I think we can and should grow that element that does not come from public contracts." He hopes to encourage the Big Lottery Fund to invest more heavily in the children and young people sector and is also looking towards the business world. "I have a long history of working with businesses and I think we can help them to understand how their funding can make a big difference to children's lives in a way that also fits with their own commercial objectives," he says. This link between Action for Children and business could range from individual donations from business leaders to sponsorship from businesses, or a "quasi-commercial relationship" in which the charity gets a service for cost price or heavily subsidised, he suggests. "How a charity must operate now is to have a very firm business head and a very passionate charity heart," Hawkhead says. "You have to have both because if it's only about business, why be a charity? But charities now have to take full-on commercial risks. To be involved in those requires a charity to be a very sophisticated organisation with a strong set of commercial skills. The scale of understanding of that in the wider world is quite small." Hawkhead, whose salary is in the £140,000 to £150,000 band, suggests that charity chiefs' pay should not be as high as it is in the private sector. "But we must get away from the slightly hysterical view that people who run large, complex organisations and have enormous demands on their time and energy should do so either voluntarily or quasi-voluntarily," he says. He says charities should have clear guidance on pay, with no staff member earning 10 times more than the lowest-paid employee.